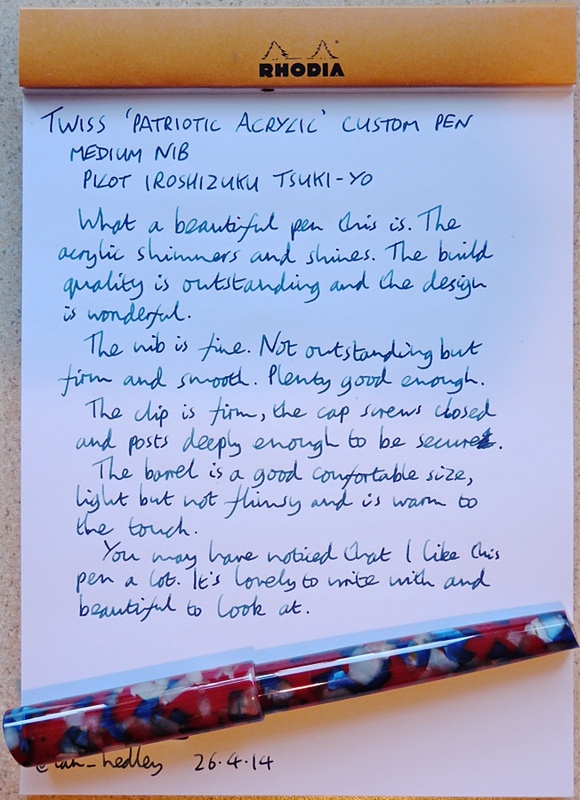 Twiss Custom Fountain Pen in Patriotic Acrylic – review and giveaway – Pens! Paper! Pencils! 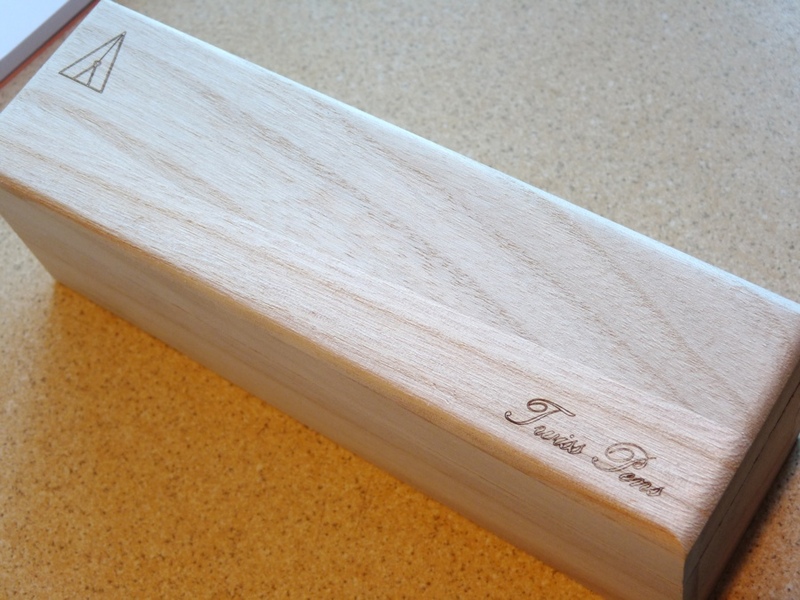 John Twiss makes custom pens to order. This is one such pen and as such it is unique. It is also very lovely – and it could be yours! Read on to find out how. 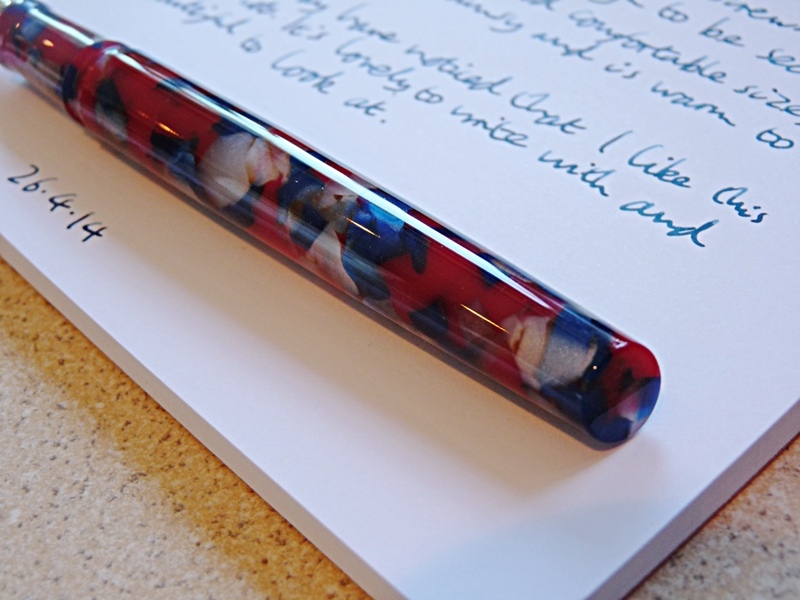 The pen is made from what John calls ‘Patriotic Acrylic’. It’s a beautiful combination of shimmery red, blue and silvery white. It’s shiny and rather lovely. This is one of those pens that gets in the way of your writing because you have to keep stopping to look at it. I love these kinds of pens. The clip is quite reasonable and shaped so that it’s easy to push onto pockets or papers. The nib isn’t spectacular but it’s smooth and firm and nice enough. This one is a stock JoWo stainless steel nib but stock italics and 18k gold nibs can also be supplied. 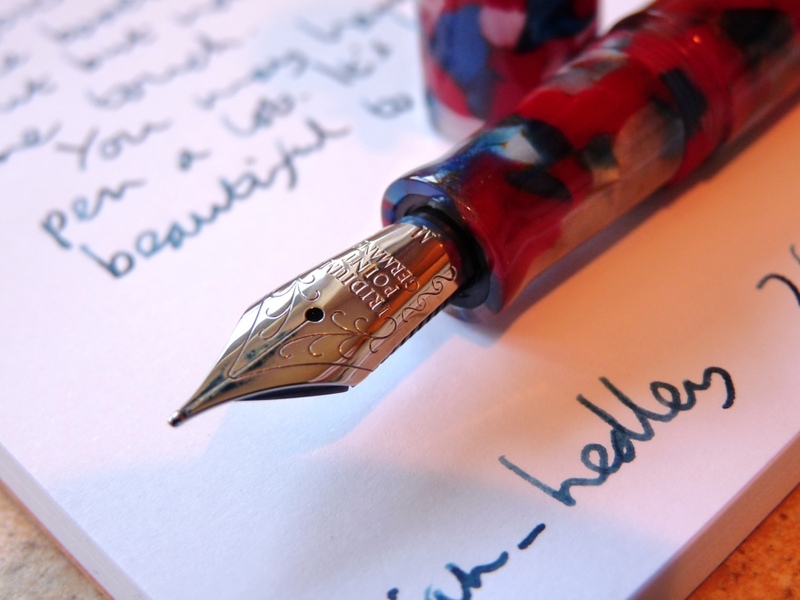 Pens can also be made using a nib supplied by the customer. 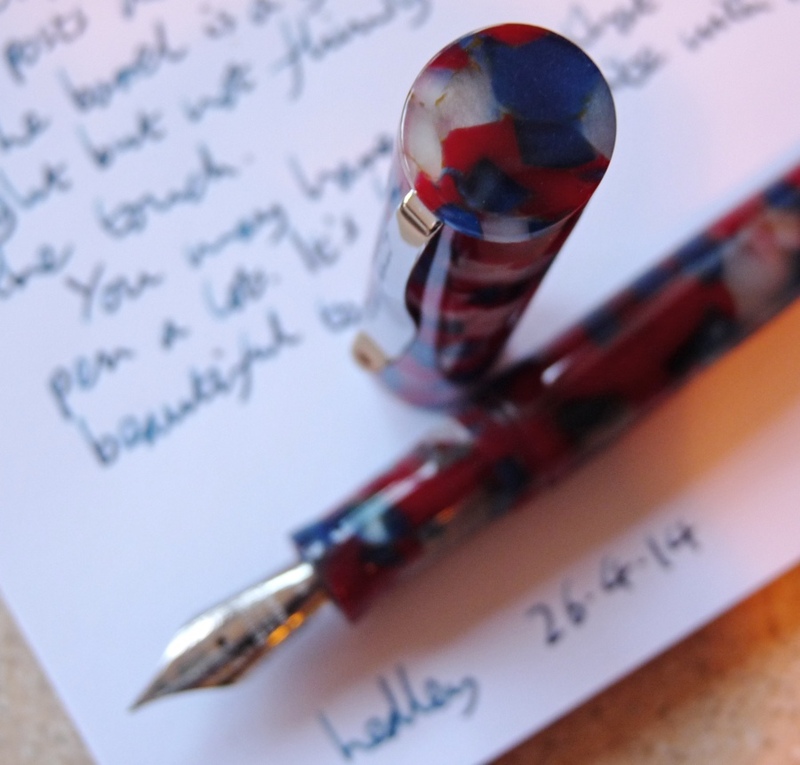 John has made pens using customers nibs from Pelikan, Bexley and Senator to name a few. The cap screws on (in a way that feels very high quality) and posts quite deeply if that’s what you want to do. The barrel, apart from looking beautiful, is a good length and weight (light but not too light). It feels warm in the hand and is comfortable to use for a long period of time. 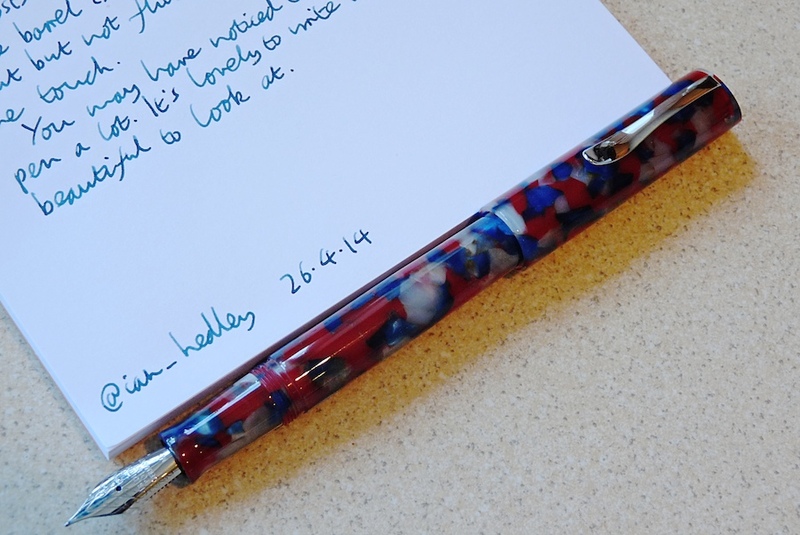 This pen is one of a kind and so, in a way, the design is less important in a review than the build quality. You can have almost any design you want. (If you haven’t already read my interview with John then have a look to get an idea of the just how varied the designs can be. Then follow John on Twitter and look at his website to see more.) Having said that, the design is beautiful. What’s more important is the quality of craftsmanship and on this pen it’s outstanding. This is a pen that’s been made by someone who knows pens. You can win this pen. 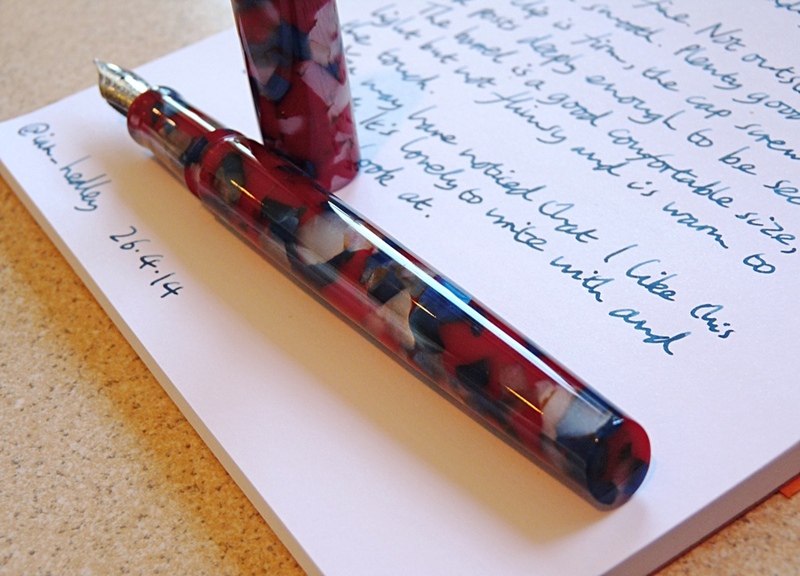 This unique, beautiful and hand-made pen. This pains me a little: much as I love you all, I want to keep this pen myself. I can’t deny it. To enter, visit the Twiss Pens website and register (in the sidebar on the righthand side). Everyone who registers between now and 9am on Saturday 10th May is eligible. A winner will be picked randomly and I’ll then contact you to arrange sending it to you. If you have already registered on the site and would like to enter this giveaway just contact me to let me know and I’ll make sure you’re included. This giveaway is open worldwide but I will not be responsible for damage or loss or customs charges during shipping. Good luck! This is a rare opportunity to win something of wonderful quality that is truly unique. Just registered with Twiss pens! 🙂 Thanks for the giveaway! Just registered. Thanks for the giveaway! done! fingers crossed! by the way, I really fancy the box! I love pens as much as I love your blog. Awesome. The pen is beautiful ! I’m registered. Thanks for sharing this givaway. The twiss ballpoints look really nice. The costs look up there but they are handmade. 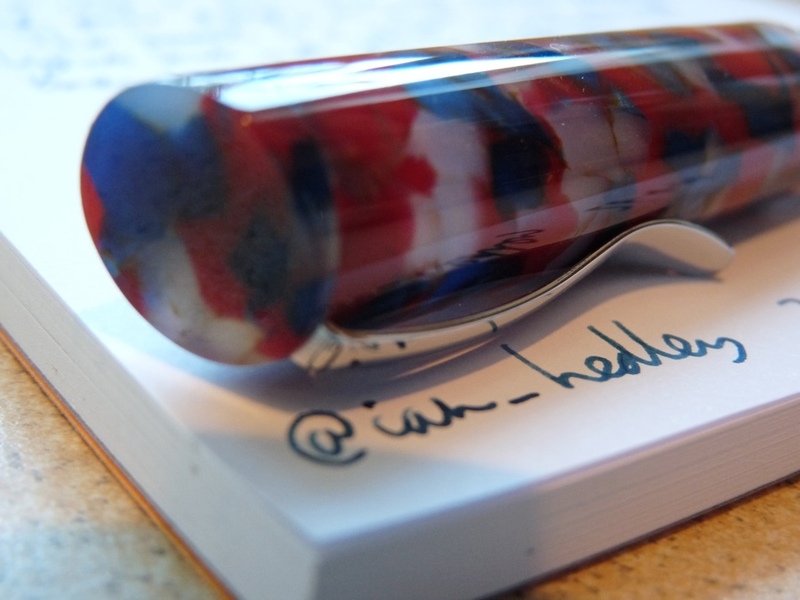 Such a gorgeous pen. Just registered. I’ve registered! Such elegant writing with these pens. Registered! Thank you for the generous giveaway! All done, thanks! Fingers crossed!